The new flow rate totaliser from Trimec. The RT20 Rate Totaliser can be battery or externally powered and features a 6 digit large LCD total, 8 digit cumulative totaliser and 5 digit rate display. 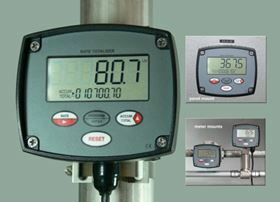 The displays on the RT20 Rate Totaliser show a resettable (batch) total, cumulative total and instantaneous flow rate in engineering units as programmed by the user. Feature of the RT20 Rate Totaliser from Trimec-Europe include a IP66/67-NEMA 4X aluminium field and panel mountable housing makes the unit suitable for the most rugged applications. The flow rate totaliser has a scaleable universal pulse or frequency inputs, scaled pulse output, long battery life, non-volatile memory and reverse polarity protection. The Watson-Marlow Fluid Technology Group has launched the new MasoSine Certa pump, offering clean pumping for food and beverage industry applications. Bell Flow Systems has installed a turbine at winery which is part owned by Bob Geldof.